This image was kindly donated by Graeme Hanlon. Not a great deal is known about this photograph or the words on the sign. It would be great to hear from anyone who has information or memories about the early days of the gardens - email wagga.local.studies@gmail.com if you would like to share your knowledge! 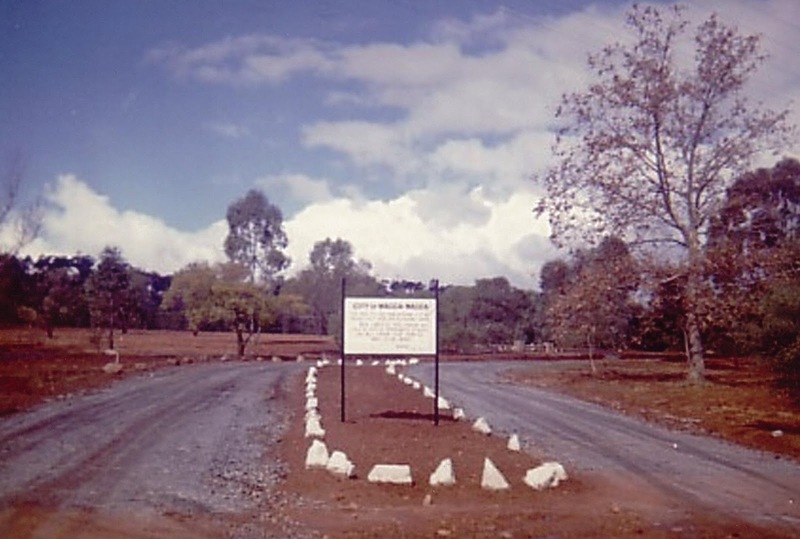 The official opening ceremony for the Wagga Wagga Botanic Gardens was held on Saturday 24 August in 1968, starting at precisely 2.30 pm. 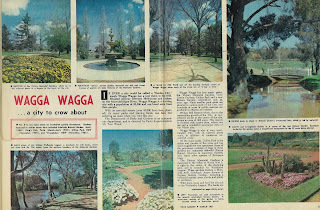 According to Gary Croker, in Willan's Hill , Wagga Wagga (2000) , the gardens had unofficially been open for business since 1963. The planning and work for the Botanic Gardens started in the 1960s, Trees were planted on Willans Hill in the 1950s by councillors, and Council staff , particularly Tom Wood, developed and grew the gardens into the beautiful and well maintained, well used, and well loved place it is today. Graeme Hanlon also donated a copy of an article , "Wagga Wagga ..a city to crow about" , from a 1967 issue of " Your Garden" on the gardens of Wagga Wagga, describing the inland city as having a legitimate claim to being called a "Garden City" : "With it's tree clad streets (over 30,000 have been planted ) , its many parks and playing fields, one feels like entering an oasis when visiting this city" . Although slightly badly written, (implying perhaps, in that first sentence, that visiting makes the writer wish they were entering an oasis) , the article is a quaint snapshot of civic Wagga Wagga in the 1960s. A full copy of the article is available to view in the library.